March 06, 2017, 11:03 a.m. The President of Iceland sparked headlines worldwide with his desire to ban pineapple from pizza. But how do Brits feel about the humble Hawaiian? Guðni Th. Jóhannesson, the president of Iceland (the country, not the supermarket) made international news a couple of weeks ago when it emerged that he wanted to ban pineapple as a topping on pizza. The president was later forced to clarify that a pineapple topping ban was merely a personal desire, not a policy objective, and that he did not have the power to create such a law in any case. Whilst the Icelandic president may not have the power, one group of people certainly do: staff at pizza restaurants. An American pizza delivery recently went viral on Twitter after the customer discovered that staff had outright refused to top their pizza with pineapple, with a message scrawled on the inside of the box branding it “gross”. Whether pineapple belongs on pizza has always been a divisive issue. Following the president’s remarks, YouGov finds that whilst 84% of Brits say they like pizza, and a similar 82% like pineapple, only 53% say that they like pineapple on pizza. 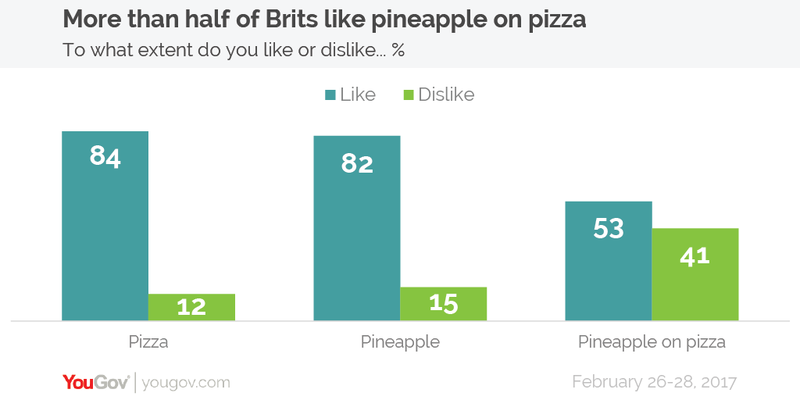 In good news for the Hawaiian haters, more than four in ten Brits (41%) dislike pineapple on pizza. Should they ever become more powerful than the President of Iceland and gain the power to prohibit toppings, 15% of Brits who like pizza would ban pineapple. This figure rises to almost half (49%) among those who dislike pineapple on pizza a lot. However, of the toppings that the public want banned, pineapple only comes fifth. Top of the list is anchovies, which more than a third of people (35%) would ban if they could – far more than any other topping. Olives came in second at 20%, followed closely by tuna at 19%. In terms of what people actually like to have on a pizza, YouGov can now reveal that the nation’s most popular topping is mushroom, which are enjoyed by nearly two thirds of Brits (65%). 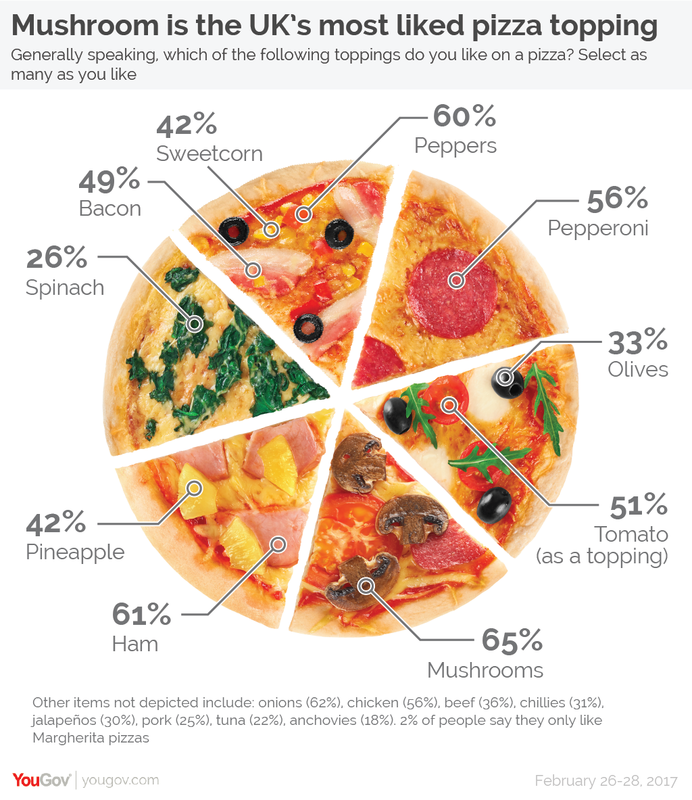 Overall, seven pizza toppings are enjoyed by more than half of the country: joining mushrooms are onion (62%), ham (61%), peppers (60%), chicken (56%), pepperoni (56%) and tomato (as a topping, 51%). Meanwhile the two fish options, tuna (22%) and anchovy (18%), are the least popular on the list. Men are much more likely than women to like meat on their pizza – a trend we also found in our previous survey on Full English breakfasts. They are also much more likely to enjoy chillies and jalapenos, whilst women are noticeably more likely to enjoy spinach. There are also some notable trends between different age groups. For instance, the older people get the more likely they are to like having mushroom or tomato as a topping, and become less likely to want chicken, pepperoni, sweetcorn and pork on their pizza.